Lenovo has announced a trio of new devices today as it looks to differentiate and gain inroads in the competitive PC and mobile computing space. The Next Web is at a launch event in London, where the Chinese electronics giant unveiled a new convertible PC and two new Yoga Tablet models, with some interesting features on board. The 32GB, Android-powered 13.3-inch Yoga Tablet 2 Pro has a built-in projector, which lets you beam 16:9 high resolution images (including movies) directly to a wall or screen. 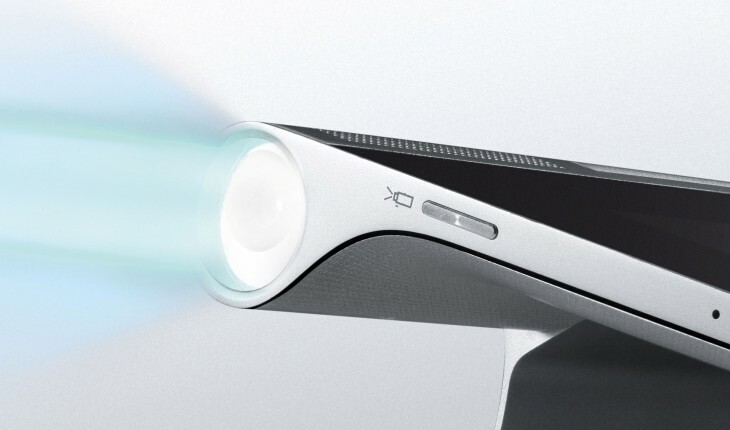 This isn’t the first tablet to sport a built-in projector, but Lenovo is one of the first big-brand manufacturers to include such a feature on a device like this. During the presentation, Lenovo demoed the projection on the conference room wall, and it was pretty impressive, given the room was far from pitch-black. To add a little pizzazz to the projection mix, the integrated 8 watt sound system and subwoofer (yup, that’s a first) promises to take portable entertainment to the next level. It also has a whopping QHD 2560 x 1440 screen, 8MP rear camera, and offers 15 hours of battery life. It has a recommended retail price of $499, and we’re told that 4G will be an optional extra in some markets. If you’re looking for something with less bling, then Lenovo has unveiled a lower-end model too. The Yoga tablet 2 ships in 8-inch and 10-inch models, each of which is available with Android or Windows on board. Some models in some countries will have the option of 4G built-in too, though Lenovo hasn’t revealed specific markets for these yet. These versions also promise up to 18 hours of battery life, which is on par with the Yoga tablet range launched last year (see below). In terms of pricing, Lenovo says the Android incarnation will set you back $249.99 and $299.99 for the 8-inch and 10-inch models respectively, while the Windows version will cost $299.99 and $399.99. Today’s launch comes almost a year after Lenovo launched the first of its new multimode Yoga tablets, a move that followed the unveiling of Ashton Kutcher as its new Product Engineer. And Kutcher again was involved with the latest launches, though how exactly how hands-on he has been isn’t clear. Indeed, the existing versions of the Yoga tablet could be used in three ways: hold, tilt and stand, with a swiveling handle letting you alter the device’s position to suit your situation. This thick end of the tablet is also where Lenovo manages to house a bigger battery, hence why it has been able to promise 18 hours of juice. However, with these new additions to the Yoga range, Lenovo is introducing a fourth holding mode, which it calls hang. Yes, you can now hang your device on a suitable platform to display content. We’ll be striving to garner a hands-on with these devices, so stay tuned for more on this later in the event. But before that, Lenovo has unveiled another device today, one that isn’t a tablet. The 13-inch Yoga 3 Pro joins Lenovo’s existing line of convertible laptops, and sports a QHD+ 3200 x 1800 Gorilla Glass screen. At only 12.8mm thin and weighing in at 1.19kg, the Yoga 3 Pro is fairly lightweight, and it also sports the latest Intel Core M processor. The damage? $1,349 or your local currency equivalent, so it’s not cheap, but you do get a choice of Clementine Orange, Platinum Silver or Champagne Gold. Which is nice. With one eye on adaptibility, Lenovo also announced new Harmony software for the PC, which it calls a “new way to discover applications and customize how they behave.” So, for example, if you’re reading an e-book, Harmony can changes the brightness and color according to the environment. The Yoga 3 Pro promises 9 hours of battery life, and is expected to go on sale later in October. The essence and key differentiator of Lenovo’s multimode tablets lie very much in its Yoga nomenclature, as it looks to “break the mold on the current ‘sea of sameness’ designs,” as Lenovo boldly proclaimed last year. And it has gone some way toward differentiating its devices today. Lenovo has been making big moves in the mobile realm of late, with Google offloading Motorola to Lenovo in a $3 billion deal (that’s yet to be finalized) — this should see it become one of the top three mobile phone manufacturers in the world. And back in August, Lenovo revealed it’s now selling more smartphones and tablets than PCs, though clearly it doesn’t believe the PC market is dead yet, judging by the Yoga 3 Pro. We’ll be back later with a full hands-on with the latest line of Lenovo devices.